Stores Ref. 6D/645. Size large. The rubber is a little soiled but remains in very good supple condition. This example has an early moulded facepiece with the distinct rough textured finish on the upper surface. Overall shape is very good bar minor inward curling of the lower edge. The nosewire lugs are complete and undamaged. The mask does not show any cracking - even when flexed. The harness is faded and has lost elasticity. Both harness press studs retain the majority of the original brown finish. The pearl grey suede lining is completebut rather soiled and rubbed. 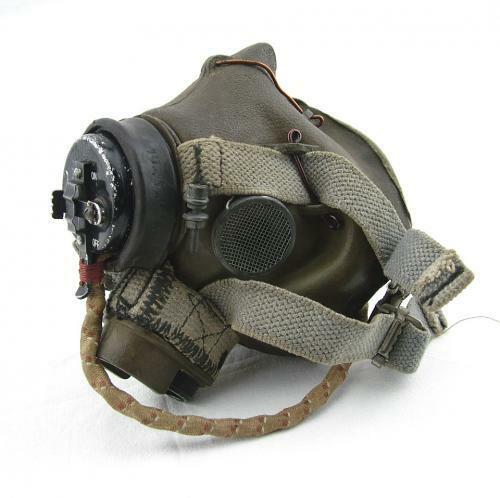 The mask is fitted with a good type 48 microphone assembly (type 26 microphone, loom and socket) complete with internal anti-freeze gauze plate and strap. A good '+' / very good used mask. Stock code O20945.